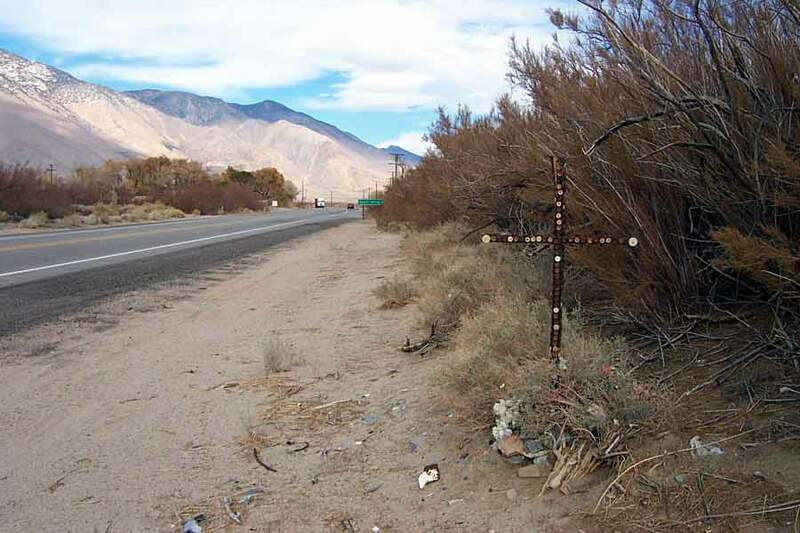 Inscription: Lots of handwritten inscriptions by friends: "RIP"
Description: This rusted, weathered wood cross on the side of the road in Olancha is very hard to see. But if you discover it, I think you'll agree this case is a no brainer. Friends of the victims have erected a cross covered in beer bottlecaps!! It is truly unique, and most likely stands testament to Bill and Jim's raging alcoholism. The victims names are spelled out in multi-colored thumbtacks - - very classy! Aged fake flowers lie at the base of this decrepit monument. The tumbleweeds at the base make a nice touch. Incidentally, it is quite rare to find such a shabbily constructed cross still standing after 6 years. Analysis: Every so often, I run across a white cross that just screams the circumstances of the accident. In this case, it is obvious that party boys Bill and Jim drove home after having one too many. Drunk as a skunk, the driver probably veered into the path of a big rig on Hwy 395. Needless to say, the big rig won.